While I learned some time back that Chicago's moniker as "The Windy City" refers to its hot-air-blowing politicians and not its actual, well, wind, it's still awesome to see the city's iconic tower making use of its iconic weather; and going green in the process. Saying it's "taking sustainability to new heights" (groan), the Sears Tower will be installing fancy, minimalist wind turbines on its recessed rooftops. This is just a part of a five-year, $350 million project to renovate the building, with upgrades in the glass exterior, internal lighting, heating, cooling and elevator systems, and those turbines, which will provide power for the building's 4.5 million square feet of office and retail space. One of the architects in charge of the design has this to say: "If we can take care of one building that size, it has a huge impact on society. It is a village in and of itself." If your village has 104 elevators and no one lives there. That is. 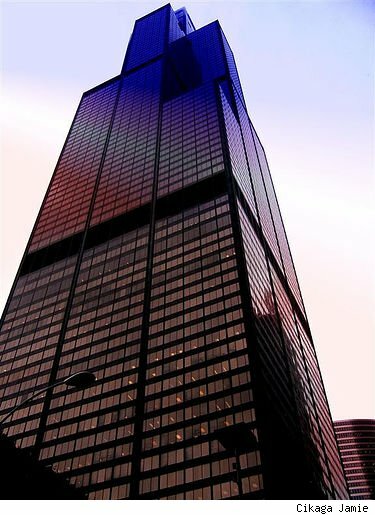 There is no report yet on whether the freely-generated electricity will be free to the businesses who lease space at the Sears Tower; the use of externally-generated power will, however, be reduced by 80% when the project is completed, a savings of 150,000 barrels of oil a year. While I have to agree this is good for the planet as a whole, it would be nice if the private equity investment, grants, debt financing and government funds used to finance the project could go towards residential real estate, too; saving people as well as businesses from dirty and expensive energy use.